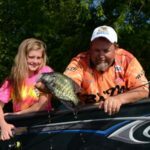 Blakely says he likes to shoot a 1/16- or a 1/24-ounce crappie jig into the boat slips on the backs of these duck blinds. 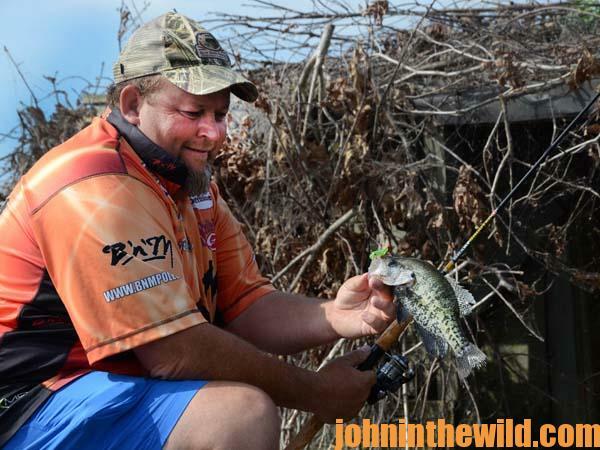 Usually, he catches some pretty good crappie fishing that way. 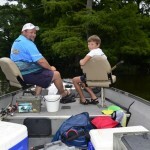 Blakely uses an ultralight B’n’M (www.bnmpoles.com) dock-shooting rod and 4-pound test line to shoot the duck blinds. 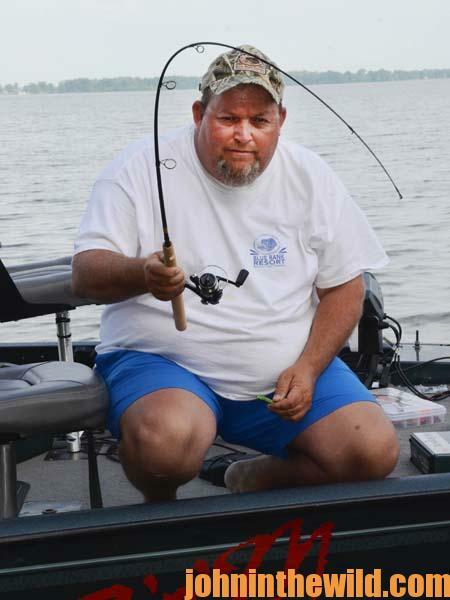 He shoots his jig as far back into the boat slip on the back of the duck blind as he can shoot it. 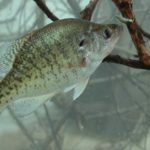 “The back of the boat slip is generally where you’ll find the most shade on a duck blind and is where crappie like to hold. 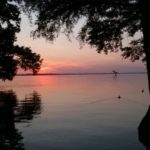 However, I also shoot a jig around the poles that hold the duck blind in place, along the sides of the blind and down the middle of the blind.” If you get your feelings hurt when you get hung-up and break-off a jig, you won’t enjoy shooting duck blinds for crappie, because there’s usually an awful lot of debris – sticks, limbs and logs around and under the duck blind. 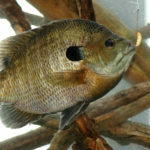 But of course, that’s the kind of cover where crappie like to hold. “Jack, find that duck,” Blakely told his son, Jack, who hunts and fishes with his dad every time he gets a chance. “I’ve been hearing it quack ever since we got close to this blind.” Jack’s young keen eyes spotted the hen mallard that neither Blakely nor I could see. “Dad, you’re not going to believe this. Look right on top of that blind about 8 feet out in front of you,” Jack said. Billy and I looked at the same time. Sure enough, a hen mallard was sitting on a clutch of eggs right on top of that duck blind. 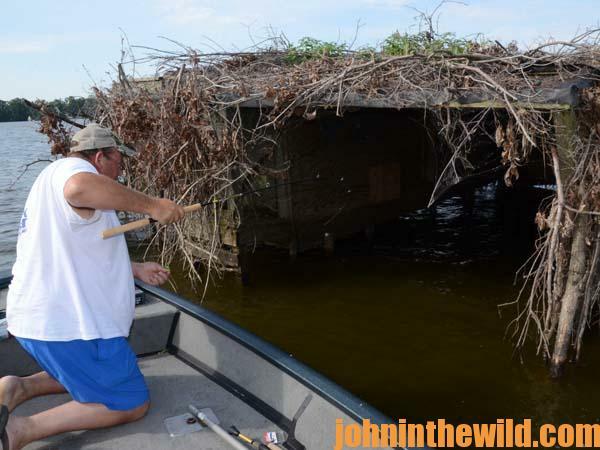 I never had seen a duck create a nest on top of a duck blind. However, because the blind was about 10-yards away from the bank and the hen mallard was well camouflaged in the brush on top of the blind, no land-based predator could get to her. Too, there was very little human traffic around the blind. This mallard could raise her chicks in safety. I asked, “Billy, what’s going to happen to those chicks when they hatch out of their eggs, and they need to get something to eat?” Blakely smiled and answered, “The mama duck will push them off the top of the blind, they’ll hit the water, and they’ll bob just like corks. 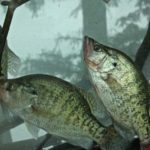 Then she’ll lead them around the lake to shallow water where they can feed.” Hunting duck blinds for crappie during the summer months certainly paid off for us. 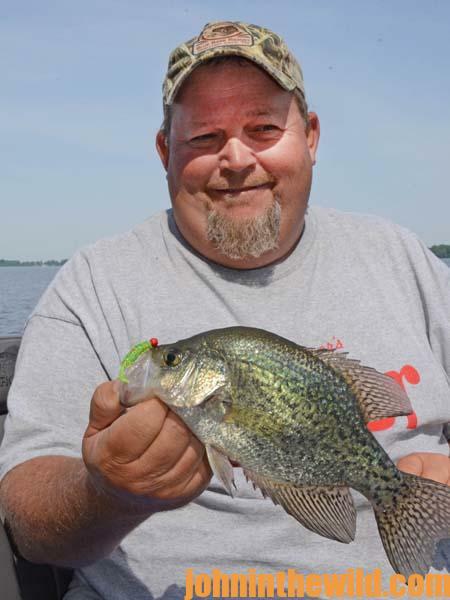 To learn much more about crappie fishing, get John E. Phillips’ Kindle eBooks and some print books, “Reelfoot Lake: How to Fish for Crappie, Bass, Bluegills and Catfish & Hunt for Ducks,” “Crappie: How to Catch Them Fall & Winter,” “Crappie: How to Catch Them Spring and Summer,” “Catch Cold Water Crappie Now” and “Catch Crappie All Year: Fishing a Single Pole, Using No Boat and Farming Crappie” by clicking on each, or go to www.barnesandnoble.com.